Ignored or imagined as ugly, the national grids of electricity are not strung and conveyed by pylons without reason. The “pylon” (name and design) is a portal that connects the many rooms of the ancient Egyptian afterlife, through which passes the ‘ka’, the energy (rather than soul) of the human being. – established the principles of three-phase high-voltage electrical power distribution. The first company to use this system in Britain was that of Charles Merz, who designed the only large scale integrated power system in the country, near Newcastle. In 1925, the British government consulted Merz in order to solve the problem of their inefficient and fragmented electricity supply industry. What resulted was the “Electricity (Supply) Act 1926” which advocated a "national gridiron" supply system. The design for the towers to carry this system was chosen by Sir Reginald Blomfield, architect and bombast, author of the virulently anti-modernist Modernismus, based upon a submission by the Milliken Brothers. Reginald Blomfield was born in the hamlet of Nymet Tracey, Devon, at the heart of what was once a sacred wood. The name “Nymet” deriving from 'nemeton' meaning “sacred grove”. Close to the hamlet there is a Third Millennium BC ‘woodhenge’ with 19 post holes. St. Boniface, who went on to wreak violence across Europe on pagan oaks and other sacred trees was born in nearby Crediton. Blomfield designed for death: he supervised the construction of trenches in the first world war, and designed the Dozinhem Military cemetery, the Brandhoek Military Commonwealth War Graves Commission Cemetery, the Menin Gate Memorial in Ypres, Flanders and made the design for the ‘Cross of Sacrifice’ used by the Commonwealth War Graves Commission in cemeteries throughout the world. In Mythogeography (the book), in the Crab Man Document, the Crab meets a couple, S-- and D----, and S-- (Sue) speaks of wanting to keep unlocked the church at “A--------”, this presumably is Aslockton, where the church was designed by Sir Reginald Blomfield. Blomfield clearly understood the connection between the pylon and the dead. His memorial to the fallen of the RAF at Whitehall Steps, London, consists of a globe, an eagle and a pylon in Portland stone. He had previously used pylons on memorials in Luton and Torquay. . So, if they are not modernist, what are the pylons? They are neo-classicist, of a kind. Classical Egyptian. They are metal versions of the poles at Bow Woodhenge. The pylons of the National Grid are, variously, suspension towers, terminal towers, anchor portals, transposing towers and deviation towers. 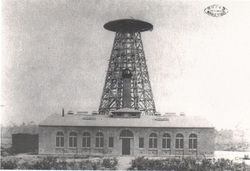 Tesla’s giant radio tower – at Wardenclyffe-On-Sound – was a pylon. But he lost the patent for radio to the fascist Marconi, some of whose earliest experimental broadcasts were made from the Haldon Hills, South Devon, close to the Treacle Mines at Dunchideock, on an intersection of the ‘Inventors’ Line’ and the ‘Devil’s Footprints’, while a guest of the Palk family, whose monumental tower (not a pylon, but a three sided folly beloved of Barbara Jones, authoress of Design for Death and Follies and Grottoes - Ash Rare Books are at present selling a number of her books - from the collection of Barry Cambray Bloomfield) features at the conclusion of the Teign Village Fabulous Walk. The web is pulled tighter by an academic who has detected an application of the Froude principles to the understanding of human gait. Such webs of steel and the placing of symbols - Royal Dutch Shell’s Pectens, awens on BSA bikes that are constantly weaving their own matrices, Saracen’s Heads and Lambs and Flags - these inscribe, without magic, a relentless morbid propaganda for the misidentification of death with power and life with frailty.